The Vietnamese depend on rice (Oryza sativa) for food security. There’s a long list of ways rice can be served, this staple grain is routinely eaten three times a day – rice noodles for breakfast, either rice noodles or rice for lunch, and rice for dinner. Growing this staple in Vietnam’s fertile soils and wet tropical climate seems easy and many of us assume this is why rice is abundant and inexpensive. I took these notes from Lilly, our Hoi An Eco-Tour Guide today. The Vietnamese government allocates land according to the size of a family, and family rice farms usually occupy between 500 to 2,000 square metres. If more land is required, this is either purchased or rented from the state. Land for rice is more easily available in the extensive Mekong Delta in southern Vietnam. The two main cropping seasons are between December and April, and between June and September. From sowing in the paddy to harvest and your plate, a rice crop takes 3 months and 10 days. Rice seed is soaked in water for three days at between 40 and 45C to initiate germination – a surprisingly hot temperature. Once the first root (the radicle) is a wisp about 3-5mm long, the seed are hand sown onto freshly ploughed, soft, wet mud. 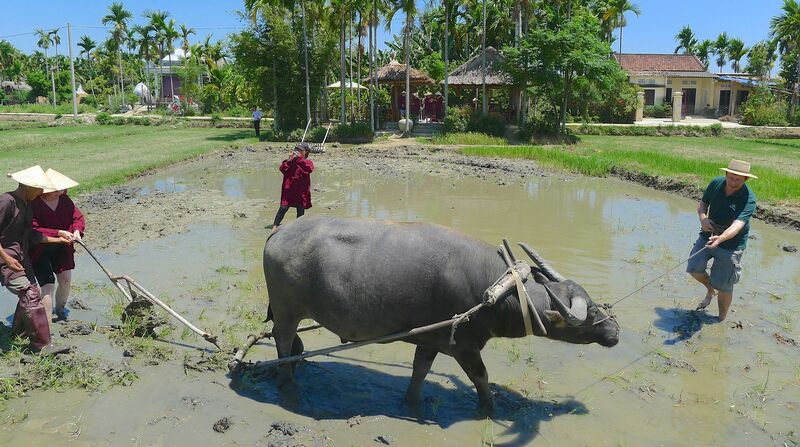 Traditionally, seed beds are first ploughed by water buffalo, then tilled by a buffalo drawn cultivator. Seed beds must be just above the water line, so any surplus water is removed. Finally, seed beds are raked until level and smooth before being sown by hand. Once seedlings are about 20 – 30cm tall, at around 3-4 weeks old, any gaps are filled by transplanting seedings. Clumps comprising of three individual plants are transplanted, using your thumb to create a planting hole of the right size and depth. Seedlings are firmed so they stand upright. A five hundred square metre paddy can yield 400kg rice, complete with hulls, in optimum growing conditions. About 30% of this weight is rice hulls, leaving 267kg of de-husked rice, currently worth US$35 per 100kg. So, in optimum conditions, a 500 sq m family paddy can earn up to US$93.45 per crop. That’s US$186.90 a year, in good weather, before you deduct the cost of fertilisers and pesticides. To save spending money of firewood for cooking (or for firing home made pottery), rice stalks are dried for fuel. Snakes, which would normally control paddy rats, the major pests of rice, are eaten. So too are rats. While this helps reduce the cost of buying animal protein, it doesn’t help balance paddy ecology. Rice root systems are ploughed back in to reduce the fertiliser bill. Ash from cooking is used as a barrier to slow the spread of Golden Snails, a rice eating pest from South America that has entered Vietnam from China. These snails were introduced as a source of food, but are not as pleasant to eat as native paddy snails and they destroy rice plants. Paddies are drained after each harvest, a technique used to cull snails. Vietnam’s monsoon can be fickle, and typhoons can drown and scour croplands. When this occurs, many families can suffer considerable economic hardship. This is where tourism can help, it offers families a chance to work for a cash in between the rice crops. Today’s visit by the ‘From Paddy to Plate’ gardeners tour of Vietnam gave us an opportunity to better appreciate the risks and the sheer hard work many Vietnamese families invest into that ubiquitous staple we take for granted. I’ve always wanted to feel paddy mud between my toes (it’s so hot!) and to encounter working water buffalo (so cool!). My thanks to Devin Hunt at The Adventure Traveller, his associate Hau, our local guide, and to Lilly at Hoi An Eco-Tour, for making a dream come true. And my gratitude for gentle, tolerant Se, the 14 year old Water Buffalo. Long may you plough your furrow! Very interesting, Jerry. I saw this happening in Thailand. Very labour intensive.